Hand Of Fate 2's The Servant And The Beast DLC Is Headed To Switch "Soon"
Defiant Development's deck-building RPG Hand of Fate 2 is receiving a new batch of DLC, with the Switch version set to be released "soon". 'The Servant and the Beast' invites players to return to the Dealer’s table once again, featuring a brand-new campaign that sees our hero strike a bargain with a monstrous entity who helps them escape from fighting pits in exchange for blood. This character, Veles the Shadow Beast, is also included as a companion who can accompany players into combat and vanquish downed foes. Veles is said to have "more dark and terrible powers, along with a vengeful quest chain filled with more encounters to enjoy and gear to unlock". Alongside this new content is the free 'Combat Reforged' update, giving the game a number of quality of life improvements. The update is set to overhaul how battles play out in the game with enhanced fighting mechanics, and will also rebalance enemies and equipment alongside other improvements to make the title the strongest it's been to date. We loved our time with the game in our review, so seeing more content make its way to Switch is very welcome indeed. All of this new content is available today on other platforms but, as mentioned above, will be arriving on Switch "soon". Pricing for Switch hasn't yet been confirmed, but the new DLC is currently available for $6.99 / €5.99 / £4.99 on other consoles - expect something similar on Nintendo's platform, too. 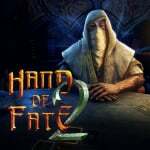 Do you own Hand of Fate 2 on Switch? Are you ready to devour this new batch of DLC? Tell us below with a comment. Forgot I needed to get this game. Loved the first one on PC but never finished it. I hope the stories aren't too connected since I'm just heading to the second one. I bought it when it came out and gave it a quick go but couldn't really get into it initially. I'll hopefully give it a proper go at some point, if I can find the time for it. I love this game, takes me back to my warhammer and magic the gathering days. I have also shouted many curses at the screen when the dice roles or wheel spins don’t go my way. Will definitely be buying this DLC and I hope there is more to come. Highly tempted to get this game, but it falls into a weird position where if I'm going to play a card game on Switch I'd kind of rather just play a card game. We've finished moving and I have most of my board games out of storage now, so Hand of Fate is competing with LOTR:LCG, Shadowrun: Crossfire and Mistfall as well as the rest of the Switch library. @JasmineDragon It's more than a card game it's an adventure with the odds stacked against you. You actually experience everything. The battles, the decisions you make and more. While you have the dealer giving you criticisms on your actions(basically beating down your morale) and giving you tidbits on how he perfected the game you're in. I love this game. Very underrated. But i will say this. It isn't for everyone, you need patience to even win anything in this. I like the idea of the game and the atmosphere in it. But when it comes to fights it's too hard for me with no difficulty level to chose. If you read the steam board players just say "git gud". I tried but after 10 hours of playing I gave up. If the patch gives me an easy mode I'll dive in again and buy the DLC also. If not... I have to accept that it's too hard for me. @MsJubilee You make a good case for the game, and I appreciate it. I'm still leaning towards buying it, probably will sooner or later. I do have card games that are amazing adventure games, though. Lord of the Rings is one of those, and one of my favorite tabletop games ever. This is one of the games that Asmodee is planning to port to Switch next year, and I'm telling everyone who has any interest in this sort of thing to check it out.